Today I have a fun tribal design to show you. 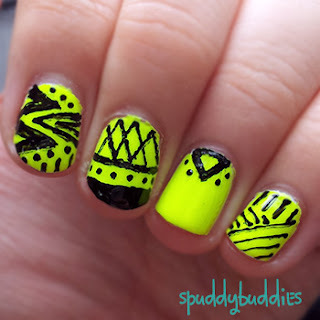 I knew I had to do nail art with Orly - Glowstick because it's so vibrant; the black nail polish just seemed to pop against the neon base. 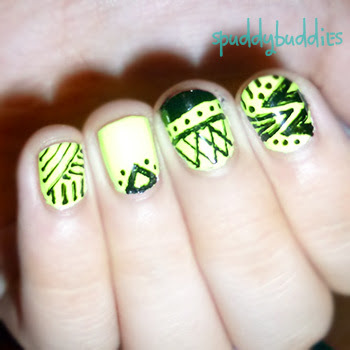 It's simple and I used a black nail art pen to draw the tribal design. I used 1 coat of China Glaze - White on White before using 2 coats of Glowstick. You can see that it wasn't easy taking the pictures with such a bright base. I personally like the design on my thumb and ring finger the most. 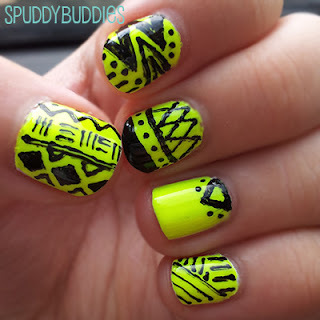 Do you like these neon tribal nails? I wish I had a steady finger. If I have to really concentrate on being still, I always have some type of spasm. It's so weird!!! I'm always afraid I am going to kick the pedicurist in the face when I have to sit still for those... lol. Thanks for your lovely comment. It took me lots of practice to get where I am today and even then I still think I'm unsteady. You are very creative and I envy your ability! I can't paint my own nails to save my life but I have fun doing my daughter's. She will love some of your designs. Can't wait to try! You are truly talented...these nails are gorgeous! This would be great to link-up to Create It Thursday for this week…it's live now! Hope you'll join us! Aww, thanks for your sweet comment, Leslie!! <3 I'll head over right now. Yes I'll give it a go; I've been playing around with new colours lately and even experimenting with a bit of glitter but that's about the limit of my nail art talents so far :P . Might see if I can convince my friend to let me practice on her first... easier to do it on someone else I expect? Very Cute! Thanks so much for sharing at Tuesdays with a Twist. Hi Mary! Thanks for dropping by. I'll head over right now.